Rogue: Hey there Sugahs! Rogue here and I�m here interviewing a lovely, new, up and comer in the corset and steampunk department. Her name is Eva and you might have seen her work around and if not make sure to check out GearPunk�D. I was lucky enough to get a chance to work with this talented designer during the Spring. We did a lovely shoot in High Park for a new line that she putting out! So Eva, thank you very much for taking the time to speak with me. Rogue: So let�s start with the basics, tell me a little bit about GearPunk�D Tell me about GearPunk�D? 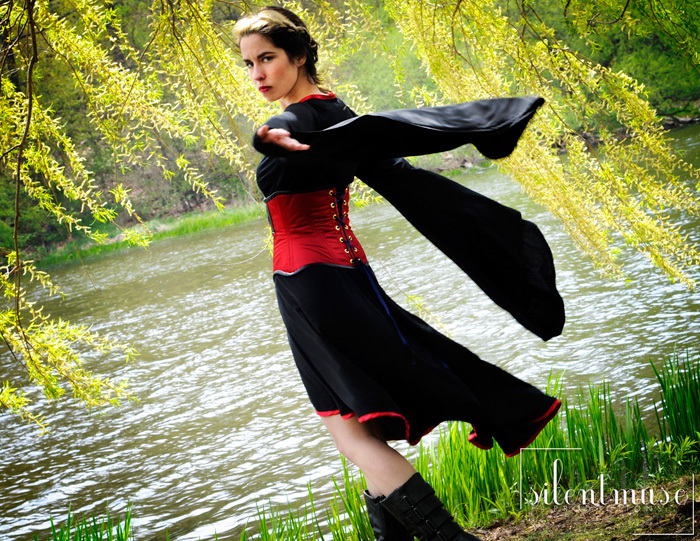 Eva: GearPunk�D is my little business where I sell handmade costumes and accessories. 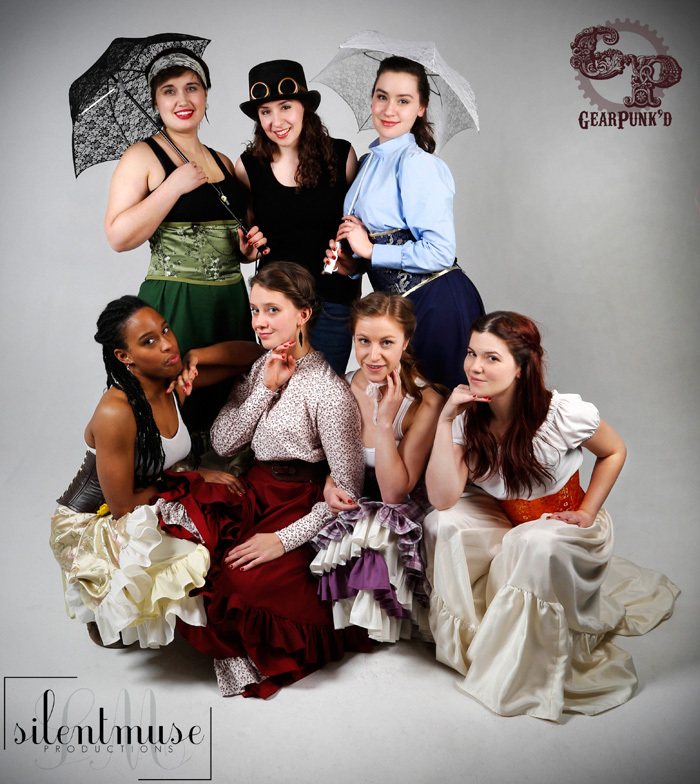 I like to think of it as �Steampunk with a Twist�, because I focus on taking things, ideas and characters that are not conventionally steampunk and give them a Victorian spin. For example, one of the first items in my Etsy shop was the Steampunk Spider(wo)man corset � I took the not-at-all-steampunk Spiderman and made it into a Victorian corset! GearPunk�D is also my creative outlet, and the source of more joy and stress in my life than I could ever have imagined when I opened my little Etsy shop about a year ago. I have pin-holes in all my fingers, am constantly covered in bits of thread and I don�t have much time to sleep, but it�s all worth it when I finally get an sold item ready to ship or get the photos back after a shoot! 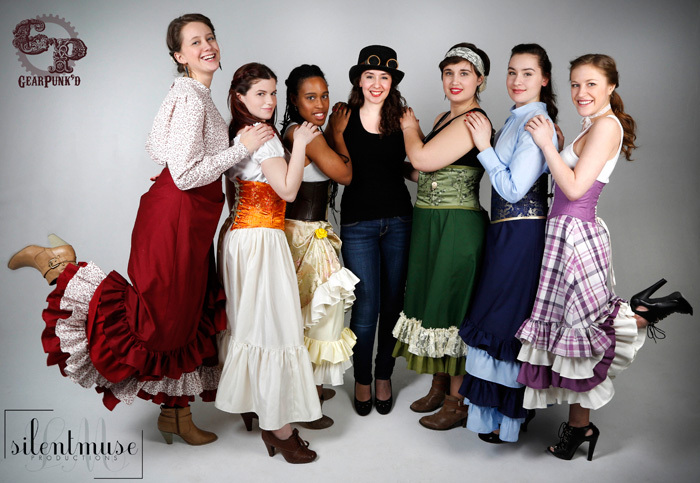 Rogue: So you don�t just make corsets correct, but other items as well? 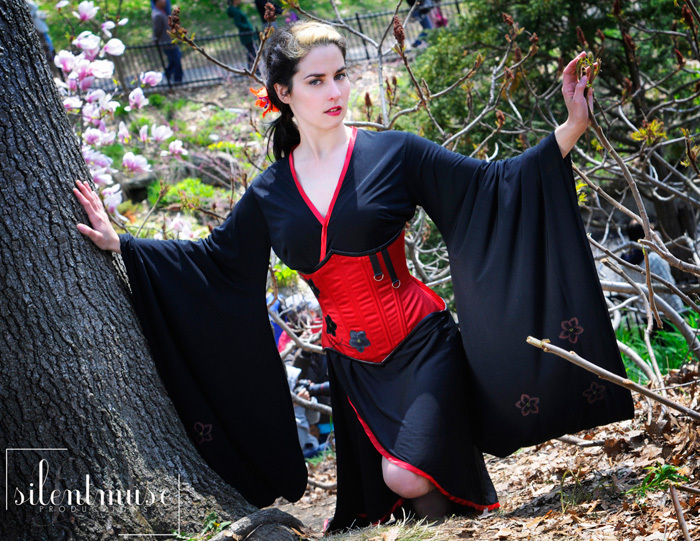 Eva: Yes, I have some skirts and blouses in my Etsy shop right now, as well as corsets, and there will be some awesome steampunk kimono-style dresses for sale soon! I also love doing custom work, and will happily take custom orders for just about anything you can imagine. If you weant it to be made of fabric, I�m your gal! Rogue: Good to know!, I�m sure our readers will appreciate that! How did you get into steampunk? Eva: A friend introduced me to the fashion side of steampunk a few years ago as we were deciding on costumes for a convention, and I instantly fell in love with the whole neo-Victorian style! I�ve been learning more and more about the literary origins of the style, and I enjoy the way that much of steampunk literature celebrated human ingenuity and inventiveness, and glorifies the role of the �tinker� and �inventor�. I moonlight as an environmental scientist, so I find the idea that humans can invent ways to solve almost any problem to be a very appealing notion. Rogue: Haha I couldn�t agree more. Although having both the literary and scientific interest must be an asset. 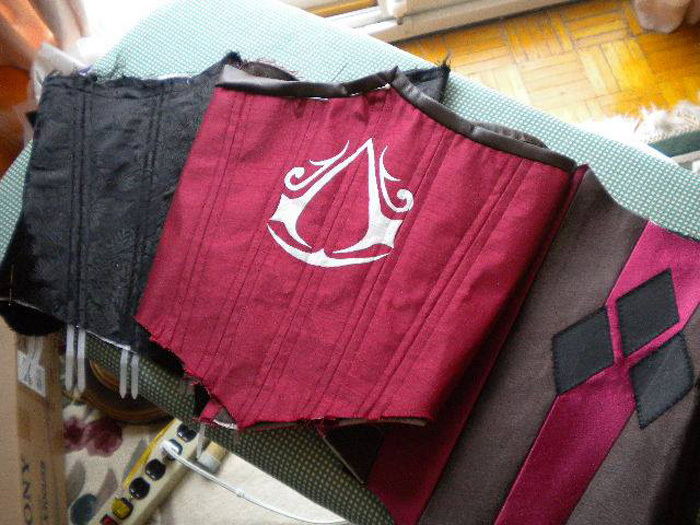 In regards to the costuming itself - have you had any formal training in costume making? Rogue: Colour me impressed, I�ve worn some of your materials and the craftsmanship as superb. I would have thought you studied costuming. So what sort of events do you attend? Eva: I started attending events as an artisan/vendor just this year, actually. 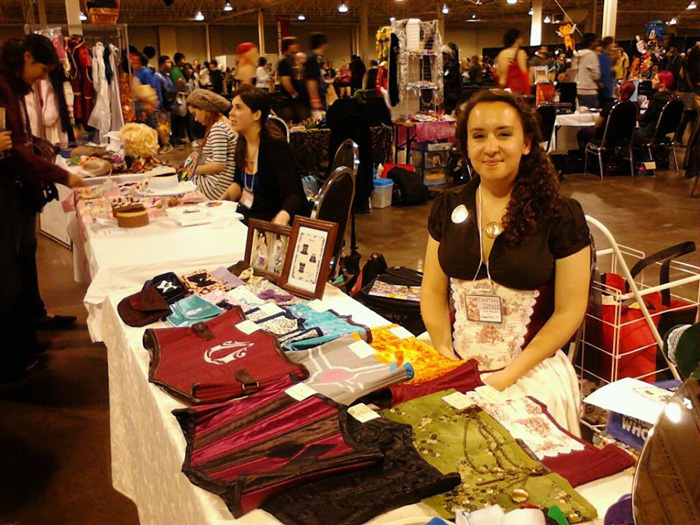 My first genre event was Ad Astra in early April, and I recently had a table at Anime North. I�ve also attended a few Toronto-based arts markets and will be taking part in the Site Bee Pop Up Shop event on Queen West for two months this summer! I�m hoping to attend several other science fiction, anime and steampunk themed events over the summer; I post upcoming events on my Facebook page, so keep checking back for updates! Rogue: That�s awesome, Any specific upcoming events that our readers can find you at? � I�ll be at the Site Bee Pop Up Shop arts market this summer, which runs from now until July 25th. It is located at 1550 Queen Street West in Toronto, and is open Wednesday to Sunday from noon to 5. � See Site Bee Popup Shop for details. Stop by for a visit! � And keep checking facebook for news on other upcoming events! Rogue: And if they can�t find you in person, where can our readers find you online? Eva: Readers can find my Etsy shop online. I�m also on Facebook, DeviantArt & Pintrest. Your Favourite Material to Work With: Cotton printed with funky patterns Favourite Sci-Fi Series: Firefly! Favourite Steampunk Lit: haven't read too much yet, but The Difference Engine by William Gibson and Brice Sterling is pretty good so far! Favourite Steampunk Film: Does Serenity count? Favourite Steampunk Accessory: I like the earcuffs made out of clock parts, those are nifty Favourite Steampunk Invention: k, this isn't steampunk, but I use it to make steampunk things - my handheld eyelet press - BEST INVENTION EVER! Photography by Silent Muse Productions. All costumes by GearPunk�D.